You may edge yourself into the bandwagon when you acquire Samsung Galaxy S4 in April 2013 as it was then Samsung’s flagship handset. Yet, currently, Samsung Galaxy S4 is the outdated phrase as its successor S5 is waiting in the wings and all eyes are firmly locked on the Samsung Galaxy S5. S5 arrives with two varieties, the prime equipped with a Samsung octa-core Exynos 5430 processor, while the standard model armed with a quad-core Snapdragon 800 processor. Also, all manner of sources suggest that Samsung may move away from the AMOLED technology in favor of LCD panels in the Galaxy S5, alongside a 2K QHD display. Still, it's highly likely the Galaxy S5 coming with the advanced Android 4.4 KitKat operating system. No doubt many a user looks forward this tantalising Galaxy S5 to bringing them a fire-new multimedia entertainment experience. Convert Videos to Galaxy S5/S7 No.1 Fast! Top Galaxy S5 video converterter to convert videos to Galaxy S5 supported MP4 MKV AVI FLV formats on Mac (El Capitan) and Windows (10) in batch and world's fastest speed. Samsung Galaxy S5: Possible to Directly Play Any Video? Owning this decent Samsung Galaxy S5, whether you can't wait to play your collected HD videos or downloaded videos like MOV, AVI, FLV on your Galaxy S5. However, the truth is that the S5, same as its predecessor, only supports certain specified video formats such as MPEG4, H.264, etc. Thus, provided you stick to play back videos on your S5, the advisable way is to convert video to Samsung Galaxy S5 compatible formats on Mac. It's undeniable that you may find out a boatload of video converters for Mac in the current market, yet, among which there may be more weeds than seedlings. Picking out the superior one seems like dredging for a needle in the sea. To save your time and energy, here genuinely recommends you the best-ever Samsung Galaxy S5 video converter-MacX Video Converter Pro to easily and fast convert any video to Galaxy S5 on Mac. 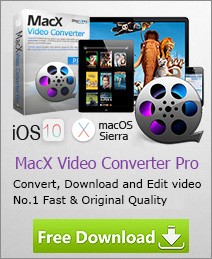 With this solid tool in hand, you can achieve converting any video like MP4, MOV, AVI, FLV, AVCHD, MKV, MTS, etc. to Samsung Galaxy S5 with an eyewink while maintaining original high quality thanks to its Intel QSV tech, multi-core CPU use, hyper-threading tech and High Quality Engine support. On top of it, this versatile video converter for Galaxy S5 is also adept at converting video to even more devices, like video to iPad, iPhone, iPod, video to Samsung Galaxy S6/S7 edge, PS4, Blackberry and more just a simple clicks in demand. After downloading this Mac video converter for Galaxy S5, launch it and then click the "Add File" button to import source video. 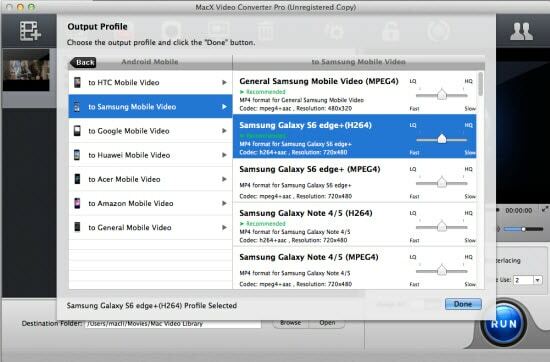 To play back video on Samsung Galaxy S5, please select "to Android" and you can find the specific output format. Embedded with 420+video/audio codecs, this Samsung Galaxy S5 video converter for Mac also allows you to convert among SD and HD videos including MKV to MP4, AVI to MP4 and more with premium high quality for enjoyment. Step 4: Start to Convert Video to Samsung Galaxy S5 on Mac. Hit the "RUN" button to begin video to Samsung Galaxy S5 conversion. You can view the conversion progress or cancel the converting process at anytime. Tips: This smashing video converter for Samsung Galaxy S5 also provides a convenient solution for those who'd like to download and convert YouTube video to Samsung Galaxy S5/S6/S7/S8/S9 edge recognized format for offline watching on the go. Certainly, supposing you have a yen for record on-screen videos, this eminent Samsung Galaxy S5 video converter can also address your needs to quickly record on-screen movements like tutorial or game walkthrough, etc. so as to let you upload them to YouTube, Facebook for sharing. This guide shows you how to use the free video to Android phone converter to convert video to Galaxy S4, HTC One, etc to enjoy video freely. What's the best video/audio format for playing on the Samsung Galaxy Series like S7 edge, S6, S5 and Note 5, Note 4 and 3? Here we list the supported video and audio formats for Samsung Galaxy devices for you to better watch videos without limitation. Mean to convert the funny YouTube video to Samsung Galaxy S5 with original high quality? This article will show you how to flawlessly convert YouTube to Galaxy S5 with maximum high quality on Mac.